Where am I? > Home > News > Is wearable tech the future for holidaymakers? Is wearable tech the future for holidaymakers? The age of smartwatches, internet-connected glasses and fitness trackers has arrived - and travel is just one of many areas of life set to be revolutionised. 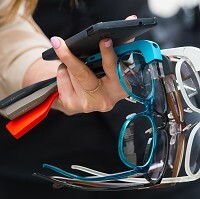 Wearable technology is being incorporated into check-in desks, with Google Glass and smartwatch users able to take advantage of virtual customer services and paperless check-ins. A smartwatch is a tiny computer that you wear on your wrist. It connects to your smartphone over Bluetooth to wirelessly show your messages, calls and app notifications. Google Glass is Google's voice-activated, internet connected eyewear - it allows you to search the web, get directions, take photos and shoot video and more. Virgin Atlantic was one of the first airlines to trial Google Glass at a lounge at London Heathrow Airport, and now plans to extend this to some of its check-in desks. Some staff at Edinburgh Airport, meanwhile, could be seen wearing the headsets to aid customer queries and track flight departures. With holidaymakers increasingly seeking stress-free travel, it is expected that wearable technology will take off in the future and may even become as widely used as smartphones and tablets. But with holidaymakers likely to be loaded up with more and more expensive tech, travel insurance is certainly a good idea to protect the 'can't-do-without' gadgets from loss, damage or theft. The advancement, though, is ideal for travellers who find carrying paper documentation a hassle, and Iberia airlines is one airline to have taken note. The firm has teamed up with Samsung to create a wearable boarding pass using a new app available on Samsung's Gear 2 and Gear Neo smartwatches. In a similar way to those who scan their mobile phone at check-in, users will be able to scan their smartwatch to board their flight. John Samuel, senior vice president of Sabre Traveller Solutions, which has launched a Google Glass flight finder app and plans to extend its services to help on-the-go travellers navigate destinations, said wearable technology on a range of devices will soon be a "prominent means of customer notification and communication". This year, more than 19 million wearable devices are expected to be sold, with 11.9 million units pushed over the next four years, researchers International Data Corporation said.